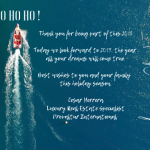 Punta Cana, Dominican Republic – The Punta Cana destination continues to be the main driver of Dominican tourism growth as it is observed that in 2018 experienced a record growth of 7.5%, receiving for its airport a total of 3,891,327 passengers, or 69.3% of foreign tourists who entered the country. 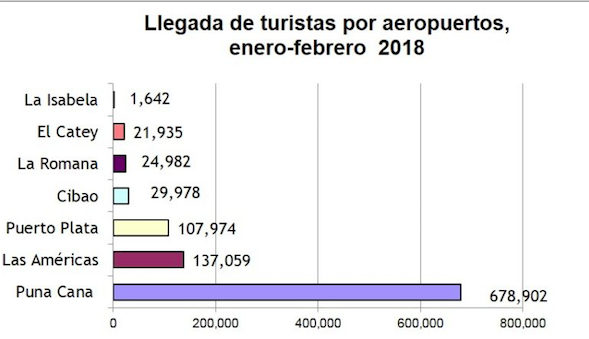 It is followed in order of importance by the Americas (16.0%) and Puerto Plata (7.3%), while the terminals of La Romana, Cibao, La Isabela and El Catey de Samaná, together received 7.4% of the total non-resident foreign visitors. 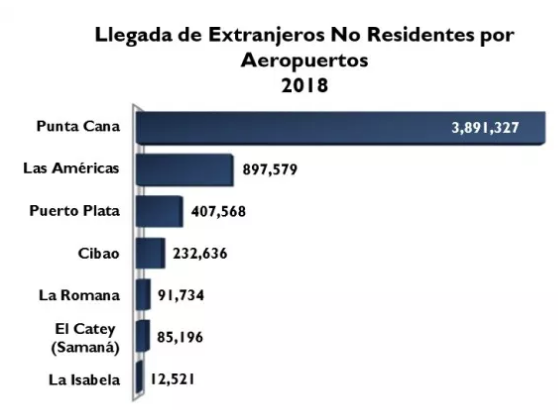 The recent report of the Central Bank RD indicates that the International Airport of Punta Cana recorded the largest cumulative increase in tourist arrivals, 270,616 additional travelers, which in relative terms represented an increase of 7.5%, followed by the terminal of Cibao (39,053), El Catey in Samaná (16,349) and La Isabela with 5,385 more travelers compared to 2017. The arrival of non-resident passengers to the Dominican Republic by air in December 2018 reached a total of 659,008 visitors, for an increase of 32,253 additional passengers (5.1%) compared to the same month in 2017. 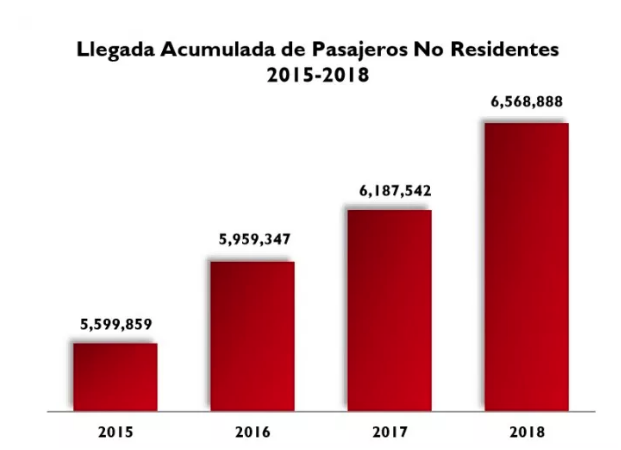 Of this increase, foreigners recorded an annualized increase of 3.8% (19,027 additional travelers) and non-resident Dominicans a year-on-year growth of 10.7%, or 13,226 more visitors than in December 2017. Including the influx of resident passengers, the total arrival of resident and non-resident passengers by air during 2018 amounted to 7,220,334 passengers, for an interannual variation of 5.7%, representing 388,451 additional passengers compared to 2017. During 2018, 95.2% of tourists reported that the main reason for their visit to the country was recreation. Also, 94.0% reported that they used hotel establishments as their accommodation option. Regarding the age of visitors, 57.1% ranges from 21 to 49 years, while in relation to gender, 52.6% are female and 47.4% are male.